Pharma Marketing Blog: Kim Kardashian's Diclegis Instagram Post Raises Issues of Transparency, Drug Safety, and Learning from History - i.e., Thalidomide deja vu! Kim Kardashian's Diclegis Instagram Post Raises Issues of Transparency, Drug Safety, and Learning from History - i.e., Thalidomide deja vu! The FDA said the post failed to give information about the drug’s risks, which is something I reported here on Pharma Marketing Blog back in July ("OMG. Kim Kardashian Shills for Pharma! No Worry - No Side Effects!"). FDA's letter ordered the company to "immediately cease misbranding." 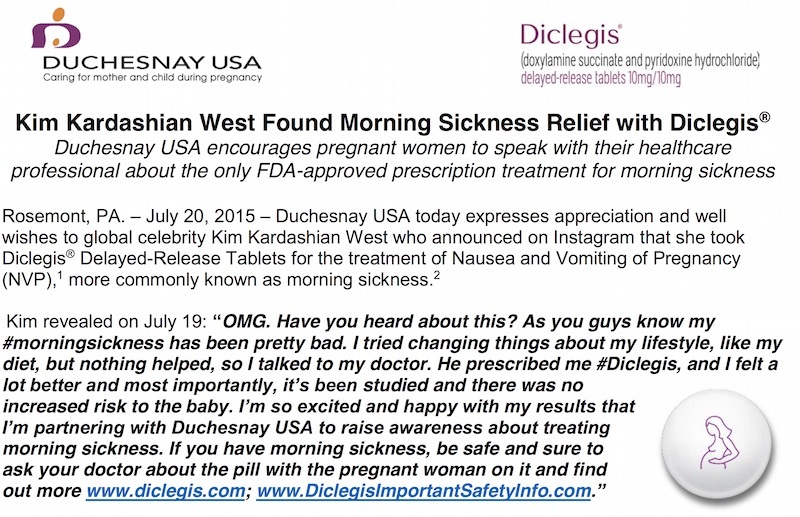 Kim -- obeying orders no doubt from Duchesnay -- removed her violative Instagram post, but it lives on in the media seen by millions and also in a Duchesnay press release (Kim Kardashian West Found Morning Sickness Relief with Diclegis). Of course, the press release also contains all the necessary risk information, including a very troubling side effect in children. Click on image from an enlarged view. If I were an expectant mother and saw this, I would think twice about taking this drug. What I would immediately think is "if this drug can harm children, what effect would it have on my fetus, which is my 'unborn' child?" John LaMattina pointed out (here) the "jarring" juxtaposition of two articles in a recent issue of the New York Times: one was an article about a court ruling opening the door for pharma to promote their new (and old) drugs off-label. The other was the obituary of Dr. Frances Oldham Kelsey, an FDA regulator who saved U.S. babies from a drug to treat morning sickness - Thalidomide! Now, we have in the news another drug to treat morning sickness. But the side effect above mentioned in the company's press release does not appear in any of the stories I have read. Consequently, Diclegis is getting FREE promotion that speaks about its use to prevent morning sickness but does NOT mention the risk to children. Is this a Thalidomide deja vu? WE NEED CELEBRITY ENDORSEMENT TRANSPARENCY! According to a New York Times story (here), Duchesnay would "not share details of its arrangement with Ms. Kardashian" and "Asked whether the company had helped Ms. Kardashian write the Instagram post and how much she was paid, Dean Hopkins, the general manager of Duchesnay USA, said in the statement: 'Unfortunately, the details of our partnership are private'." Yes, it is indeed unfortunate that the details of pharma's deals with celebrities -- even bloggers (read, for example, "Transparency is Good in Theory, But Not in Practice") -- are "private," just like payments to physicians used to be private. Celebrity endorsements via social media are becoming more common and it's time that pharma is more transparent about its relations with celebrities. Given the power of celebrities to influence people, should pharmaceutical pharmaceutical companies disclose the details of payments made to celebrities as they now are required to do for physician payments? Celebrities should NOT be paid to promote branded drugs. It's OK to pay celebrities to participate in unbranded disease awareness campaigns. 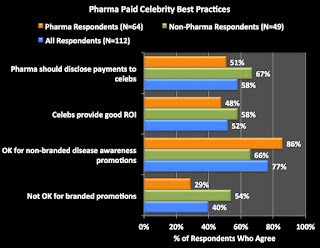 Celebrity spokespeople provide a good return on marketing investment (ie, increase sales) for certain Rx drugs. Each pharmaceutical company should be required by law to publicly disclose how much money it pays every celebrity for being a spokesperson. The results are summarized in the accompanying chart. 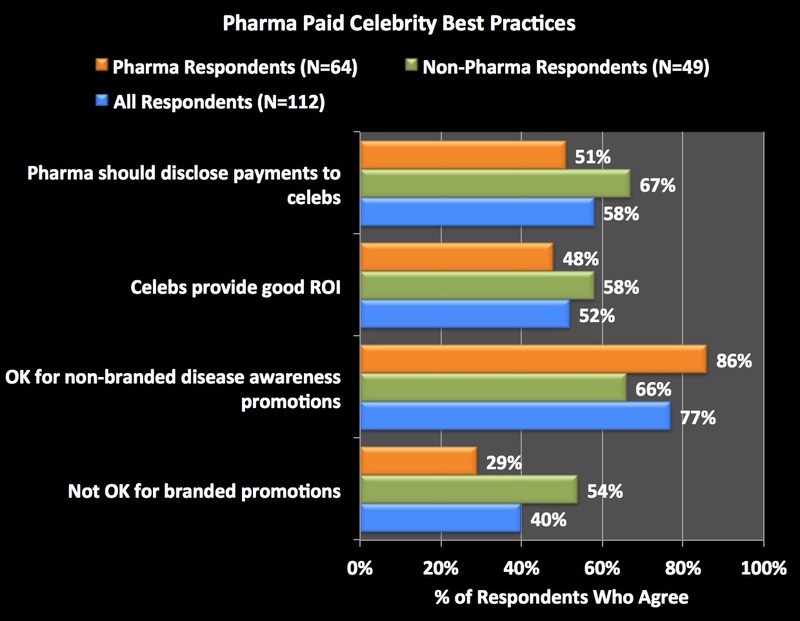 A majority of respondents agree that pharma should disclose payments to celebrities. What do you think? Take the survey here.